Framed for a crime he didn't commit. 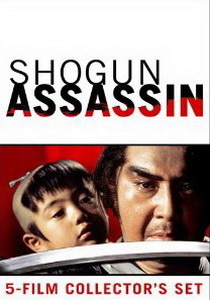 A renegade samurai warrior and his infant son are pursued by assassins hired by the Shogun. 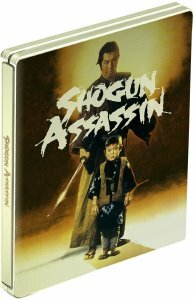 Censored, banned, mistreated, but ultimately unstoppable, this breathtaking high-definition special edition is the release Shogun Assassin fans have been waiting for. 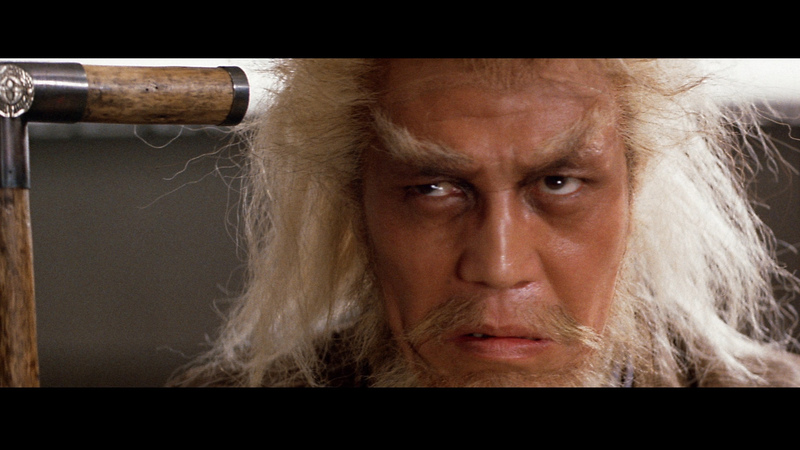 Unquestionably the most popular samurai film in the West since the days of Akira Kurosawa, this chanbara classic was lifted from a hugely popular comic book saga and, still wet, transferred glistening to the screen. 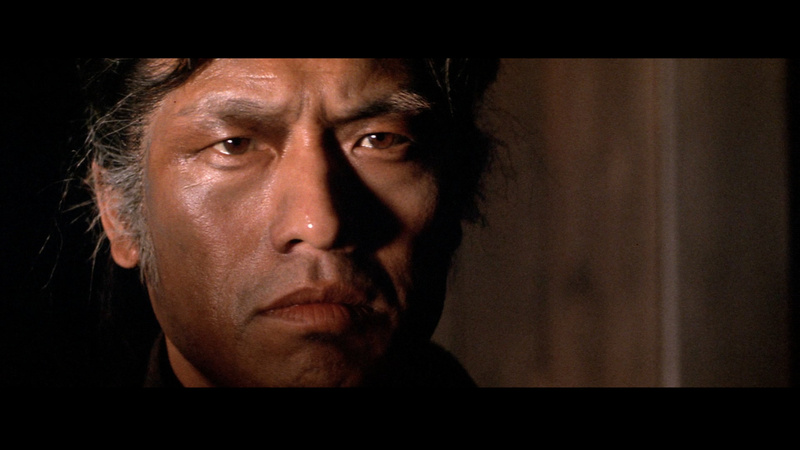 After being framed for disloyalty to his clan lord, disgraced ronin Itto Ogami (with three-year-old son Daigoro in tow) travels medieval Japan as the most skilled samurai-for-hire bar none. But as the treachery and obstacles in his latest mission quickly pile up, Ogami is forced to handle it the only way he knows how. 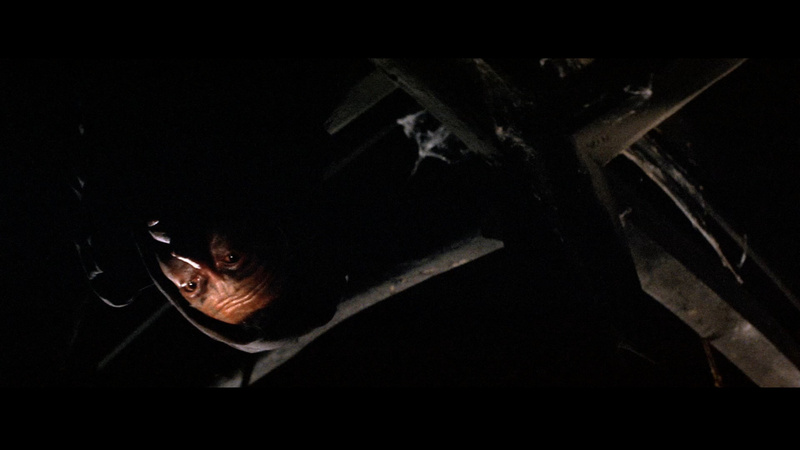 A re-scored, re-dubbed reassembly of the first two films in the Lone Wolf and Cub series, the result has become an ageless cult sensation in its own right: a crazed thrill-ride in a booby-trapped baby cart, propelled on arterial spray, hurtling gleefully to nowhere. One of the most enduringly popular and deliriously violent action films of the 1980s, originally censored by the BBFC for cinema release and then banned as a video nasty. 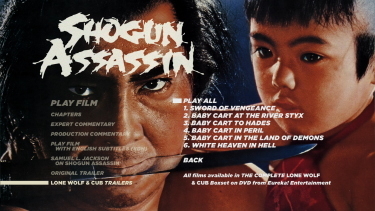 Shogun Assassin is the North American theatrical version of the first two 'Lone Wolf and Cub' films, 'Lone Wolf and Cub: Sword of Vengeance' and 'Lone Wolf and Cub: Baby Cart at the River Styx'. 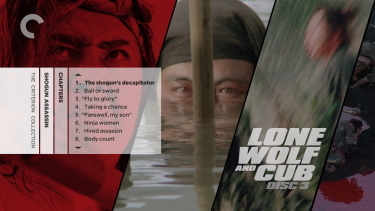 The plot for Shogun Assasin's takes 12 minutes of footage 'Lone Wolf and Cub: Sword of Vengeance' and over seventy minutes of footage from 'Lone Wolf and Cub: Baby Cart at the River Styx'. 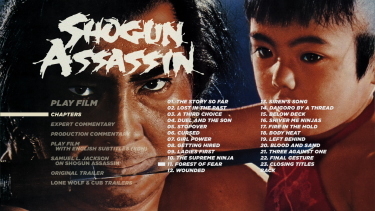 To help simply and stream line the story, a voice over was added for Shogun Assassin. 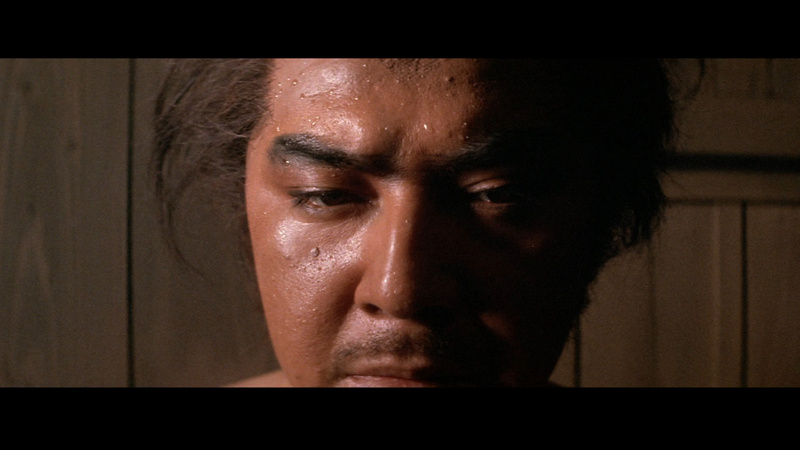 Story wise Shogun Assassin stays fairly close to the first 'Lone Wolf and Cub' with the main difference being the removal of all Yagyu Clan references and in their place the shogun has become the main nemesis of Ogami Ittō, the renegade samurai. 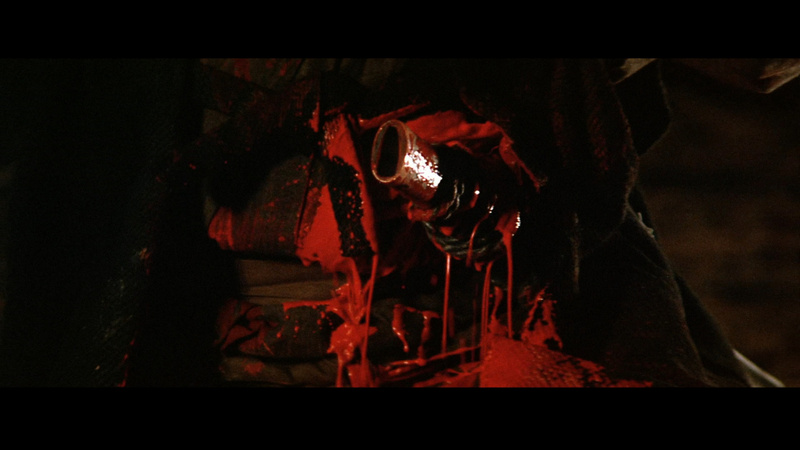 One of things that the 'Lone Wolf and Cub' films are known for are their blood-soaked death scenes. And it appears that the majority of these moments have made their way into Shogun Samurai. While it is easy to see why this film has obtained a cult following. The end product while highly entertaining. 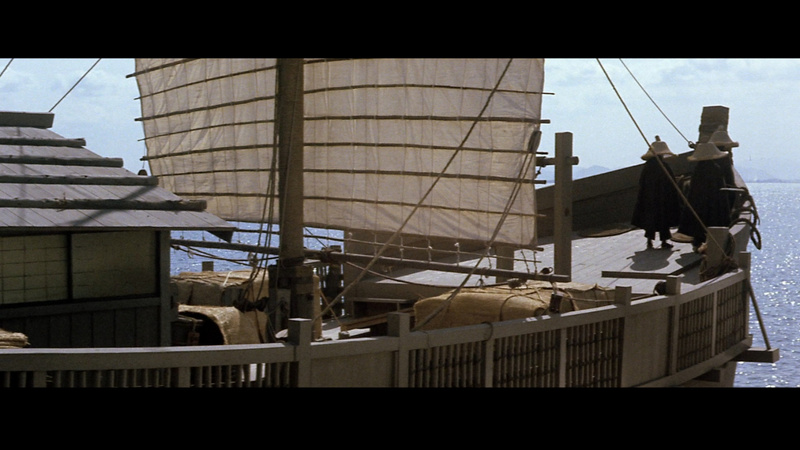 It still pales in comparison to the first two 'Lone Wolf and Cub' films. Big thanks to Michael Den Boer for the DVD Review! Comments NOTE: The below Blu-ray captures were obtained directly from the Blu-ray disc. 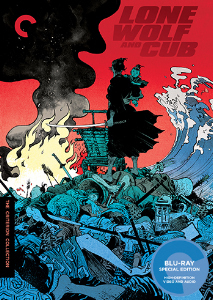 ADDITION: Criterion (Lone Wolf and Cub boxset) Region 'A' - Blu-ray - October 2016: Just a few comments and will make more at our complete review of Criterion's Lone Wolf and Cub boxset located HERE, where this is an extra. It has a high bitrate - looks fairly similar but perhaps a shade superior (contrast), unfortunately has only lossy audio (English DUB only) and offers no subtitles. The Eureka steelbook is waaaay out of print. ADDITION: Eureka (Dual Format) - Region 'B' Blu-ray - (November 2010): The new Eureka HD transfer looks just great - visually a large step beyond the DVD edition. Skin tones lose the orange hue, detail advances notably and colors tighten up and show far better balance. 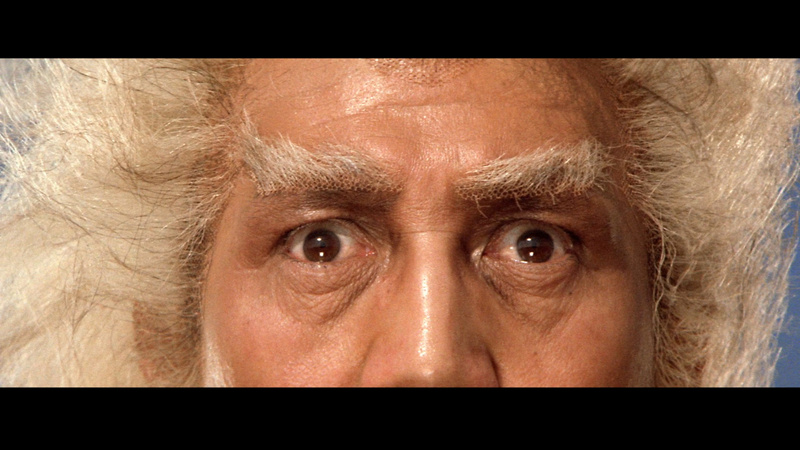 The UK Blu-ray is dual-layered and appears competently transferred 2 years after the release of the Animeigo DVD. Audio also advances with a lossless DTS-HD stereo track at 1583 kbps. 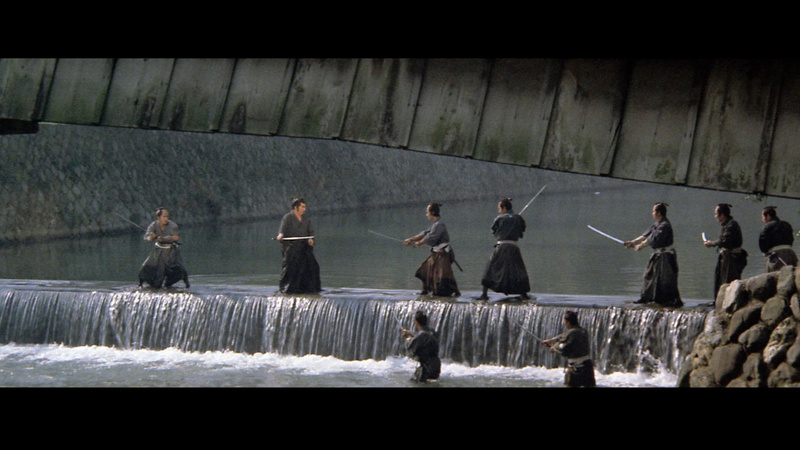 There is some depth notable with plenty of sword-wielding effects. There are optional English subtitles (see sample below) and my Momitsu informs me that this is region-locked to 'B'. The Eureka includes the same audio commentary as the Animeigo DVD with film scholar Ric Meyers and martial arts expert Steve Watson but adds a second featuring producer David Weisman, illustrator Jim Evans and actor Gibran Evans (the voice of Daigoro). 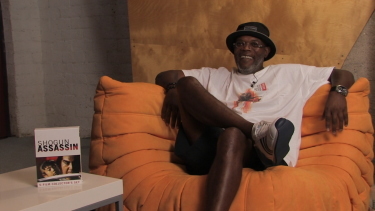 Kind of cool is a 2009 video appreciation of the film by actor Samuel L. Jackson for about a dozen minutes where he admits to owning over 8,000 Asian films! 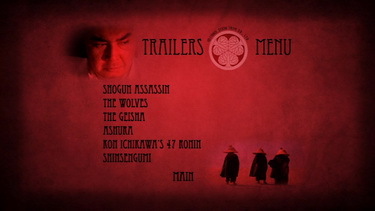 We also get an HD theatrical trailer for Shogun Assassin and original Japanese trailers for all six of the original Lone Wolf and Cub films. 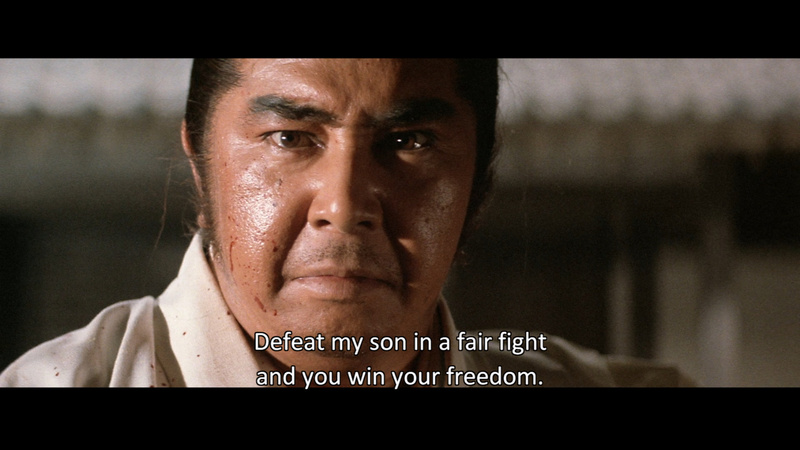 This is quite a quintessential chanbara adventure - plenty of blood and honor. The Blu-ray bests the older DVD on every front (a/v and supplements) and comes in a cool steelbook case with a PAL DVD of the feature included (hence 'dual format'). We give this a strong endorsement. 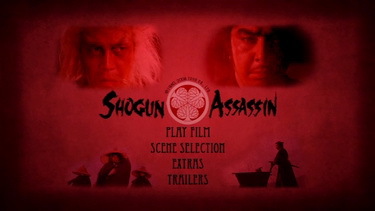 ON THE DVD: Shogun Assassin is presented in a anamorphic widescreen that preserves the film's original 'scope' 2.35:1 aspect ratio. For this transfer AnimEigo uses the same masters which they used for their DVD releases of Sword of Vengeance and Baby Cart at the River Styx. 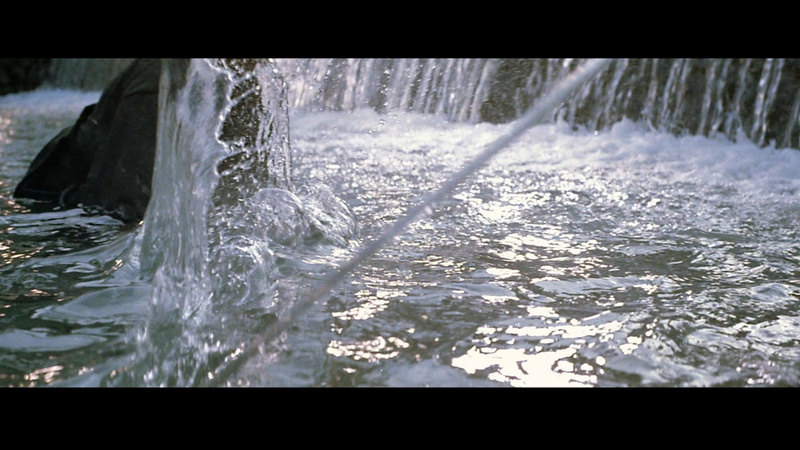 in order to recreate as usual master of Shogun Assassin they also have added stock footage from other lesser sources. Colors look vibrant, details generally look crisp, flesh tones look accurate and black levels fare well, with a few instances where things look a tad too soft. 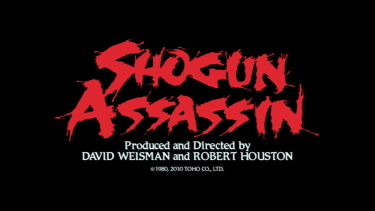 In all this is a very good transfer that gives Shogun Assassin it's best home video release to date. Shogun Assassin comes with one audio option, it's original English dubbed audio mix which is presented in a Dolby Digital stereo. 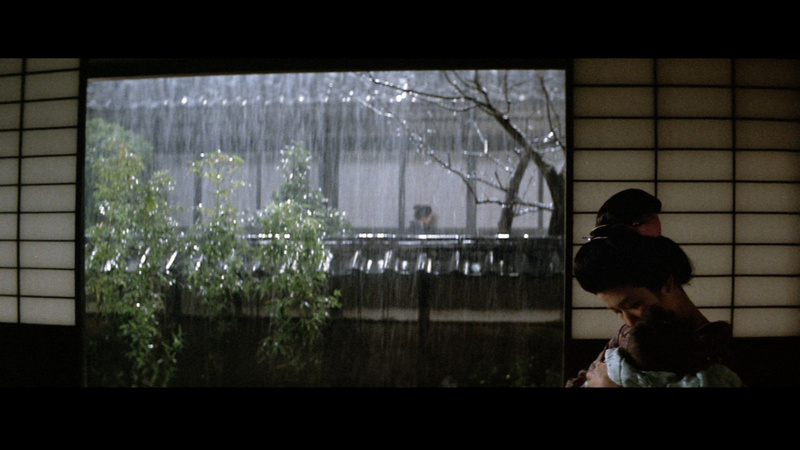 It should be noted that there are several instances where Japanese text appears in the film and English subtitles have been included for all instances where Japanese text appears in the film. Background noise is kept to a minimum. Dialog is clear and everything sounds balanced. 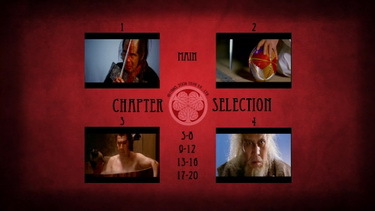 Also included with this release are the other four film's which make up the Lone Wolf and Cub series. 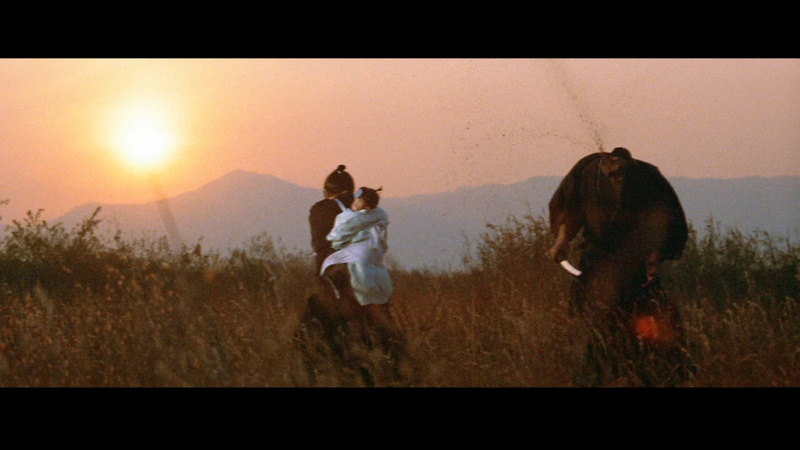 Just like Shogun Assassin, these four films are presented in a 2.35:1 anamorphic widescreen. Transfer wise these all appear to be the same transfers used for the Japanese language versions of these films that were also released on DVD by AnimEigo. 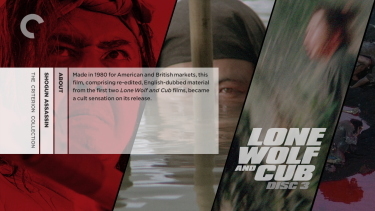 Each of these four films come with one audio option, a Dolby Digital stereo mix in English. And they all also come with the aforementioned English subtitles for Japanese text that appears in each film. Extras wise each film gets a image gallery, trailers and program notes, which is essentially text related info about each film. 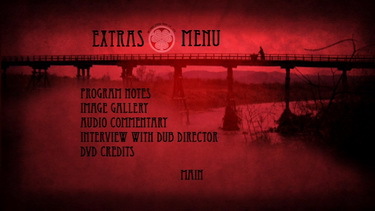 The main extras a interview with Scott Houle the English Dub director for Shogun Assassin 3-5 and the audio commentary with film scholar Ric Meyers and martial arts scholar Steve Watson. These are both located on the first disc. The audio commentary is a detailed account of the various aspects of this production and the original Japanese versions of the first two Lone Wolf and Cub film's is also discussed in depth. Rounding out the extras is a booklet with liner notes about each film.